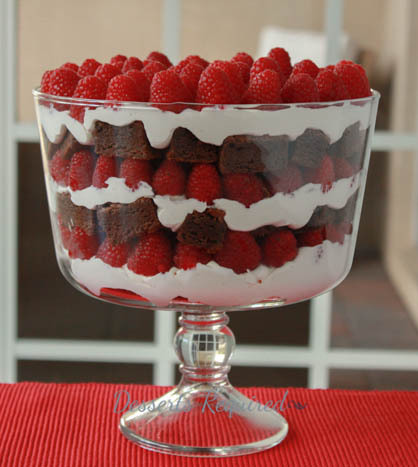 Brownie – Raspberry – Chambord Whipped Cream – Trifle. Need I say more? Perhaps a few more words are in order. I had never made a trifle before. I have seen some gorgeous ones along the way but did not own a trifle bowl, so I never thought of making one. Yet, trifles seemed to call my name. At first is was just a mere whisper but, as of late, it became more like the sound of a screaming child and I knew it was time to take the plunge. In hindsight plunge sounds a little over the top in describing the effort involved in making a trifle. I began by making Budge’s Brownies in a rectangular baking pan, let the batch sit in the refrigerator until the brownies were very cold, cut them into small pieces and started putting my trifle together. Brownie Raspberry Chambord Whipped Cream Trifle consists of three layers of each of these components. You will need 1 batch of brownies, heavenly Chambord whipped cream and roughly 36 ounces of raspberries. The gelatin added to the whipped cream insures that it does not break down, this being a major bonus. I shared my first Brownie Raspberry Chambord Whipped Cream Trifle with a group of friends and was so excited that they, too, flipped over it. Unfortunately, I was not able to get a good picture of the trifle before serving it, which meant I had to make another. Knowing that this trifle serves a small army, which I do not have at home, Samuel and I dropped the second one off at our local fire department. They are heroes in our eyes and it was a pleasure to share something so beautiful and delicious with them. I learned a very valuable lesson from my Brownie Raspberry Chambord Whipped Cream Trifle. Make more trifles…soon!! Preheat the oven to 325º. Spray 9” x 13” baking pan with nonstick cooking spray and line with parchment paper. Set aside. Place the eggs and pinch of salt into a mixing bowl. Mix on low speed for 20 seconds. Add the sugar. Mix on low speed until combined. While the mixer is on, add ½ of the chocolate mixture. Combine. Add ½ of the flour mixture. Add the vanilla. Alternate again until the remaining chocolate and flour mixtures have been thoroughly incorporated. Bake at 325º for 40 minutes. Remove from the oven and cool completely. Refrigerate for several hours or overnight. Once cold, cut into small pieces (approximately 2” x 2”) and set aside. Place the whipping cream into a large mixing bowl fitted with a balloon whisk. Add the Chambord and confectioners sugar. Mix on medium speed. Place a layer of brownies on the bottom of the trifle bowl. Start at the outside and work your way in. They should be touching each other but not crammed in. Transfer ⅓ of the whipped cream over the brownies and use a small metal spatula to help spread it evenly around the top. Place a layer of raspberries, bottom side down, on top of the whipped cream. Start at the outside and work your way in. They should be right next to each other. Repeat the layering two more times, ending with raspberries on top. The gelatin should not be hot to the touch, just lukewarm when it is completely dissolved. You must work quickly when adding it to the whipped cream or the gelatin will set which will ruin the whipped cream. I beat the whipped cream on medium speed for better control. Too fast and the whipped cream will be done before the gelatin is dissolved. Pull out the prettiest 12 ounces of raspberries before you start layering your trifle so the top layer is highlighting the most gorgeous berries. Additional time is needed for the brownie to cool in the refrigerator. The fab folks over at RecipeLion are having a BlogHop with favorite summer potluck recipes. Brownie Raspberry Chambord Whipped Cream Trifle is great for a potluck meal so I added it to the list. Check it out! Thank you so much! I have never tried using whip cream stabilizer. I have to look into that option as well. I LOVE sharing new ideas! The brownie was soft and very moist. The whipped cream was fluffy with a fabulous rich chambord flavor (I don’t think I can eat plain whipped cream again). And, the raspberries were sweet and delicious. This trifle had the perfect mix of chocolate, fruit and light yumminess. It looked gorgeous and tasted fantastic! You are FAB! Thanks for being one of my tasters. With a review like this, I am going to put you on my permanent taster list!! Wow, beautiful job for your first effort at a trifle. And I love the flavors you chose. Not only is chocolate paired with raspberry a favorite, but Chambord is my favorite liqueur. Sharing your post! Thanks so much. I appreciate your comments and the share!! I want ALL of this !! Made this for NYE because wanted to bring something other than cheesecake. So yummy and beautiful presentation. Made me a superstar! Thanks Betsy! You made my day, Jill! Thanks so much for letting me know.